Tidbits about ‘The Office’ show, cast, and staff for the week ending June 29. Blog update: Creed Bratton — Uniforms. Blog update: Kate Flannery — yes on Celeb Circus and No LAmpshades this month! Blog update: Bobby Ray Shafer — I AM THE WIENER. Article: Rainn Wilson scheduled to appear on the “VH1 Rock Honors” show on July 17th in Los Angeles. Article: John Krasinski in Leesburg, Florida. Fan report: Christine reports (with photos!) from the set of John Krasinski’s ‘Farlanders’ in New Haven. Photos: photos of Steve Carell promoting ‘Get Smart’ in México. Was it not called “Get Smart” in Mexico? On the wall behind Steve is says “Super Agente 86.” Maybe they changed the name because only Americans would know of Get Smart… interesting. 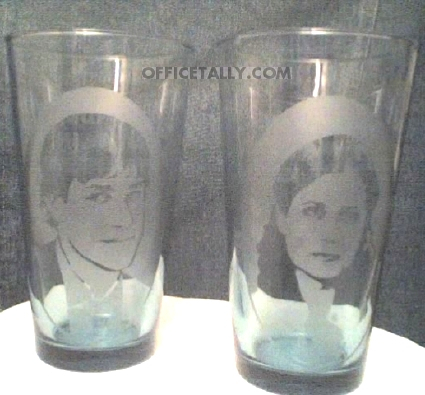 i need those etched glasses!!! I need to find out where in New Haven Farlanders is filming… I live only about 40 minutes from there! I’m visiting family about a mile from Leesburg! Too bad I didn’t see JKras. Those glasses are awesome! I’d buy one. And how cool is it that Christine got to meet John Krasinski?! Thanks for sharing with us. Amanda should sell those glasses on Etsy or someplace. I bet a lot of us would buy them! Nice work! Hello #1 The office Fanatic, in Mexico we know the series get smart but with the name “Super Agente 86” (superagent 86), when releasing the film in Mexico named just as the series. megan – you did better than I would have. I probably wouldn’t have been able to take his order. Nice work! These are awesome! I would definitely buy these! Oh my. John looks GOOD in a white t shirt. But the beard is killing me. Shave it off! Please? thanks! if it is possible for me to love him any more…i do. low maintenance coffee drinkers make the best boyfriends, imho. Previous PostPrevious Happy Birthday, Melora!